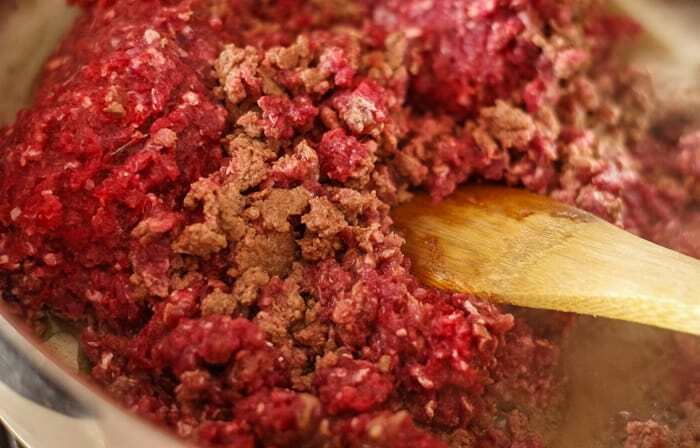 A ground venison recipe that will have all your family rejoicing! 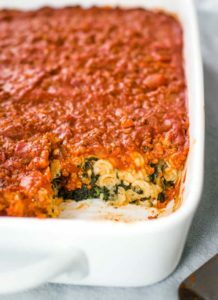 Layers of golden potatoes, green chilis, lots of garlic and a savory blend of soft cheeses make this hunters casserole a big win! If you didn’t already know, my husband is an avid hunter. We pray every Fall for a deer to fill our freezer with roasts, tenderloins, steaks and ground meat. 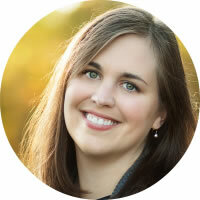 I enjoy making and creating recipes that use organic ground venison meat. 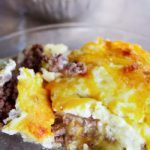 Recently, I made Instant Pot Venison Steak and today, I’m going to make a version of shepherds pie with ground venison that is out of this world! We call it hunters casserole because it has two pounds of hearty venison. 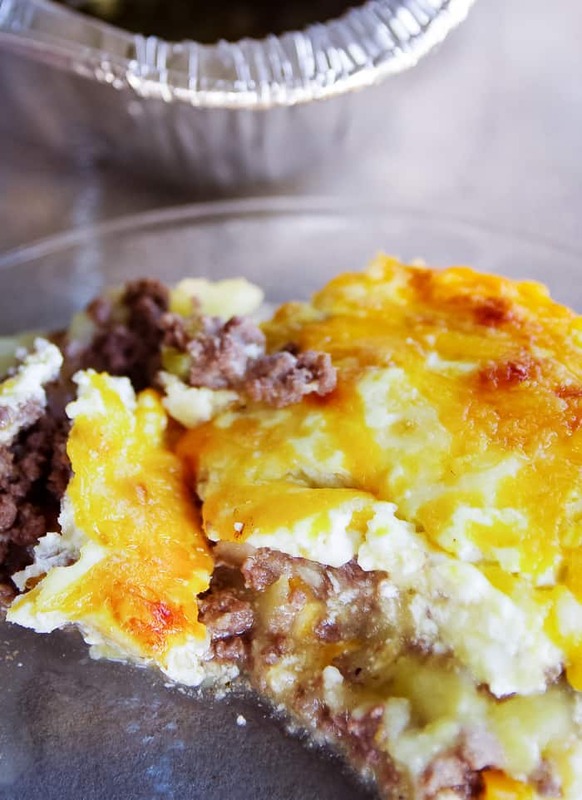 There are some great supporting characters in this recipe too – golden potatoes, green chilis (like this venison tamale pie), lots of garlic and a savory blend of soft cheeses for the top. I originally created this ground venison recipe for a 13×9 pan, but today I am making two smaller casseroles using square roasting pans. We will eat one tonight for dinner (with no leftovers!) and I will freeze the other pan for later. 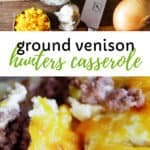 However you do it, this hunters casserole made with venison meat is simple, balanced and FULL of flavor. Are you ready to make a deer meat recipe called hunter’s casserole with me? Come on in to my kitchen! Using a large pot, boil two pounds of skin-on golden potatoes in lightly salted water until fork tender. 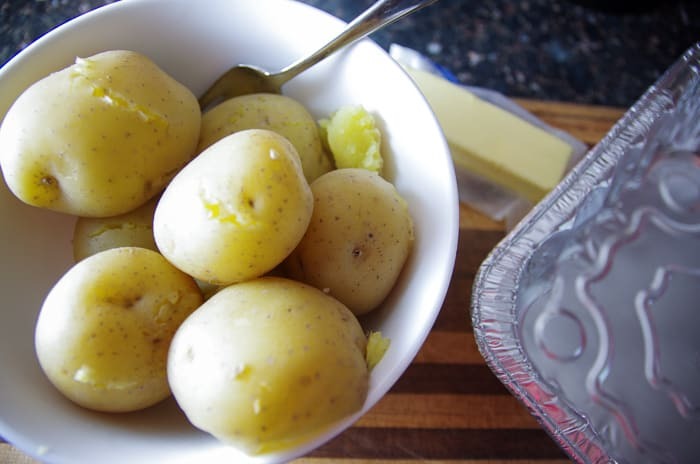 Drain the potatoes and mash them well with ½ cup (1 stick) of butter. 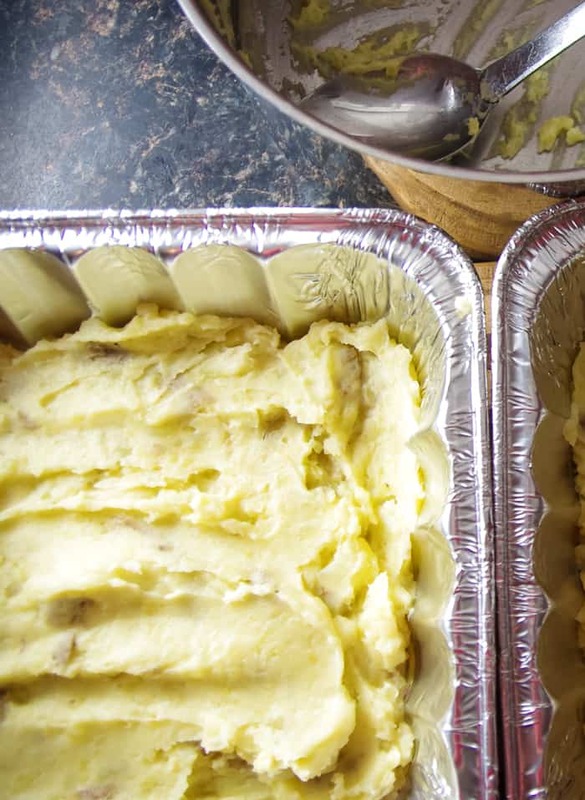 Spread your mashed potatoes into the bottom of a 13×9 pan or two smaller square roasting pan(s) and set aside. Meanwhile, brown two pounds of ground venison in 1 Tablespoon of olive oil (to prevent sticking) and drain the cooked venison meat if necessary. 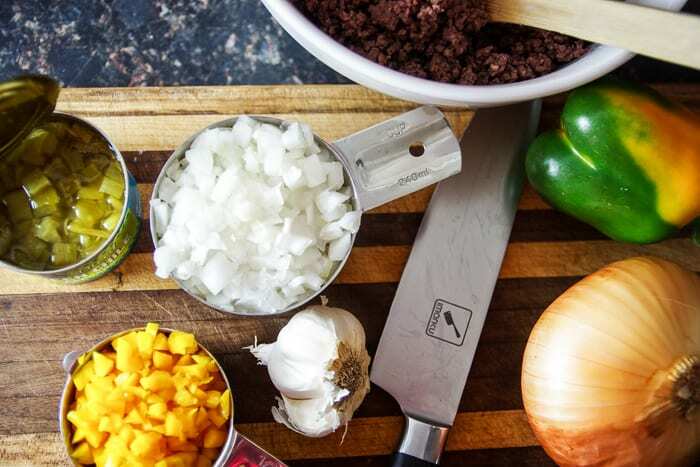 Venison is so lean that you can usually skip the draining, but if you are using ground beef as a substitute, you will want to drain out the excess fat. Remove the meat and set aside, but do not clean your pan yet. Chop up 1 cup of white onion, yellow bell pepper and garlic. You could use any bell pepper you have on hand, but I am partial to the yellow ones. My pepper picky kids think the yellow pepper is extra cheese. 😉 Saute the vegetables for 3 minutes in the same pan you cooked the meat. Next, add the undrained can of green chilis, Worcestershire sauce, salt and cracked black pepper. Saute for another 2 minutes and remove from heat. Stir your cooked vegetables into your bowl of deer meat and spread it on top of the mashed potatoes to make the second layer. In a separate bowl, mix together the eggs, ricotta cheese, cottage cheese and remaining ½ tsp. of salt. 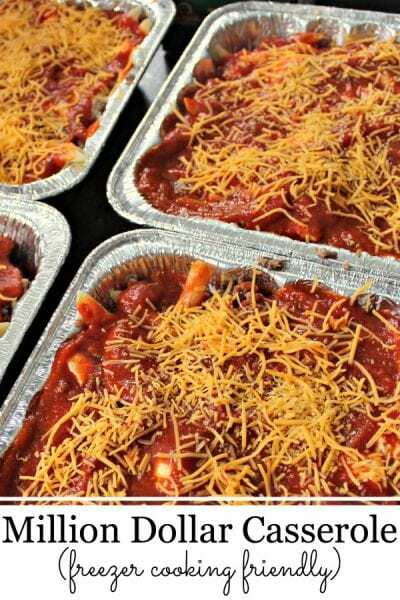 Pour the cheese mixture on top of the meat layer and top with shredded cheese. 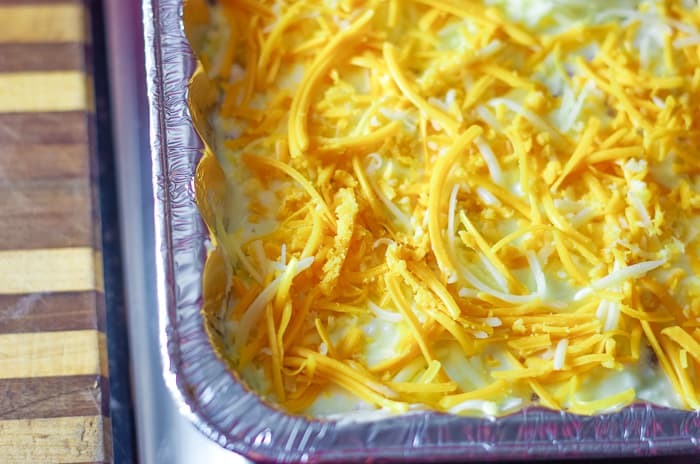 If you are going to freeze any or all of your casserole, cover it with heavy duty foil and freeze it up to 3 months. Be sure to thaw the casserole completely before baking. 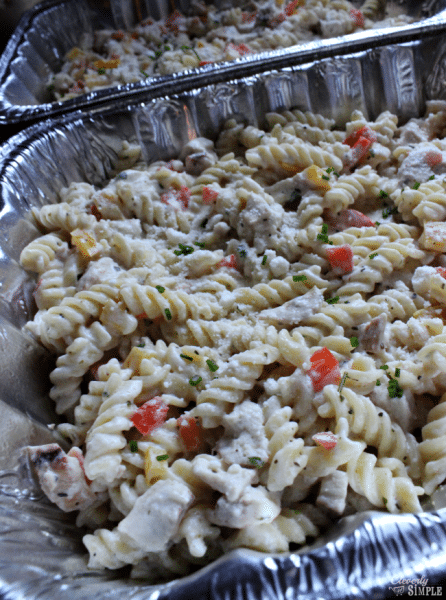 When ready to eat, bake the casserole in a preheated 350 degree oven for 35 minutes or until hot and bubbly. Your kitchen will smell amazing. Using a large pot, boil two pounds of skin-on golden potatoes in lightly salted water until fork tender. Drain the potatoes and mash them well with ½ cup of butter. Brown two pounds of ground venison in 1 Tbsp. of olive oil and drain the cooked meat if necessary. Remove the meat, but do not clean the pan. 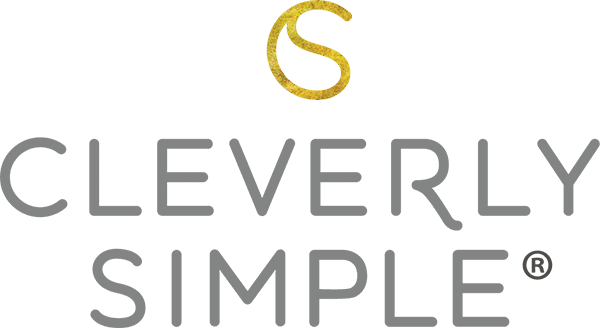 In the same pan that you cooked the meat, sauté 1 cup of chopped white onion, ½ cup of chopped yellow bell pepper and three minced cloves of garlic for three minutes. Add the undrained can of green chilis, 1 Tbsp. Worchestershire sauce, 1 tsp. Hungarian paprika, 1 tsp. salt and ¼ tsp. cracked black pepper and sauté for an additional 2 minutes. Stir your cooked vegetables into your bowl of meat and spread it on top of the mashed potatoes to make the second layer. 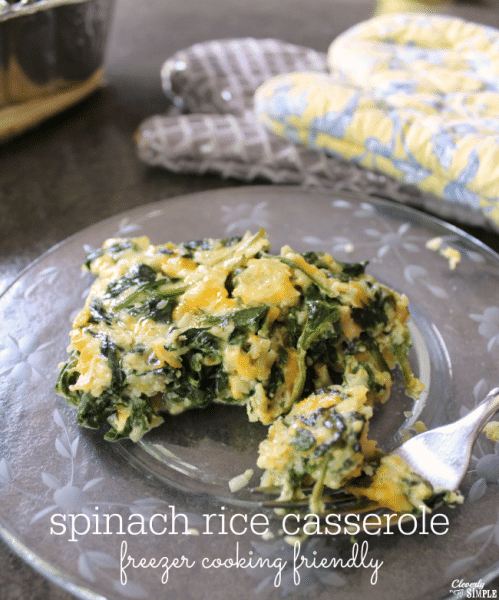 In a separate bowl, mix together the eggs, ricotta cheese, cottage cheese and remaining ½ tsp. of salt. Pour the cheese mixture on top of the meat layer and top with 8 oz. of shredded cheese. Bake in a 350 degree oven for 35 minutes or until hot and bubbly. Don’t have Venison? 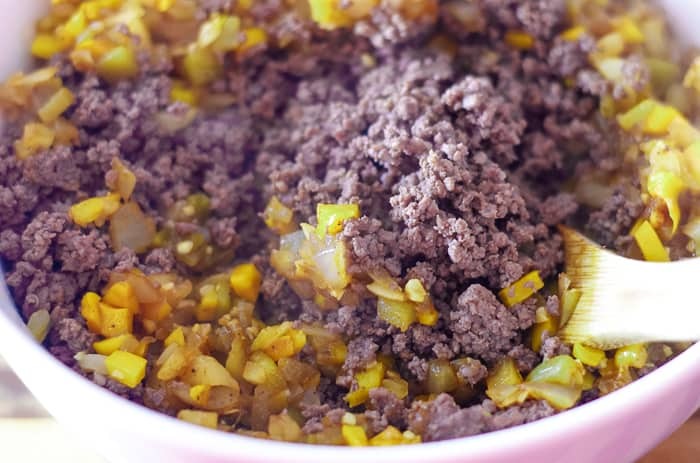 You can easily make this recipe with ground beef.